Michigan State traveled to Allendale to take on Grand Valley State in a doubleheader to start off the semester. The Lakers were victorious in two very different games over the 13-manned Spartans. The first game quickly turned into a rout. GVSU started school one week before MSU and had one more week of practice under its belt, and it showed early. The Lakers took points early and without much trouble to take 3-0 lead into the half. In the second half, the rust began to come off the Spartans as although they gave up two more points, they were far more competitive in the second half. Both teams realized that the outcome of the first game was set, and turned their eyes towards match number two. The second game bore no resemblance to the first. MSU continued their tradition of double headers against GVSU in which the Lakers blow them out in round one, and then get all they can handle in round two. GVSU took the first point in a little over ten minutes. Quality team throws eliminated many of the key Spartan players. A couple catches kept hope alive for MSU, but they nonetheless fell behind 1-0. The second point started out similar to the first, with GVSU taking an early man advantage. But Assistant Captains Andy Lieblich and Alex Zajac made clutch catches and great throws to take the point with just over 30 seconds left in the half. The first point of the second half turned out to be the decisive point. MSU methodically eliminated many Lakers through quality throws in transition. With just over nine minute remaining, Captain Colin O’Brien eliminated Austin Morley to take GVSU down to five players and a ten-second shot clock. The teams traded a couple of throws before MSU set up a team throw on GVSU #42. Zajac threw low and left and O’Brien threw high and right. #42 was able to narrowly avoid Zajac’s throw while proceeding to catch O’Brien’s against his face. The catch was an enormous momentum shift as GVSU had eliminated the leader of the Spartans. The Lakers were then able to take down the eight remaining MSU players to take the point with around eight minutes remaining. The final point point ended without either team eliminating the other. The Spartans were able to take GVSU down to a ten-clock after a fury of catches. However, time was not on Michigan State’s side as the clock ran out with a couple of Lakers remaining. The rust was clearly present for the Spartans as they only had two practices prior to these two games. However, despite only having thirteen players, Michigan State competed very well in the second game against the undefeated Lakers. This game was the second game this season in which the Spartans had a chance to take the lead late in the second half against GVSU, in addition to two other games that they were in position to tie. Michigan State will play Grand Valley at least two more times before Nationals, at the Michigan Dodgeball Cup as well as the CMU Showdown, as they look to capitalize on their opportunities and grab their first ever win against GVSU. With the MSU Invite approaching on Sunday, MSU looks to honor the man who founded the event. It is with great honor that MSU Club Dodgeball inducts its newest member into the Hall of Fame. 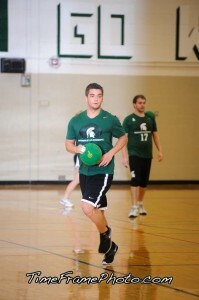 Ian was arguably one of the most important Spartans to ever come through Michigan State Dodgeball’s program. He was the head captain my freshman year (2010-2011), and I personally considered him my most important mentor in my Dodgeball development. He had a no-nonsense type approach with his team, but always commanded respect from anybody in the room who was listening to him. Ian’s captaincy ended at 2011 Nationals with a heartbreaking loss to GVSU 2-1, but it was clear that the program that he built was one full of players destined for success. Ian never did anything halfway in regards to running the Dodgeball club. Being president and captain at the same time, Ian spent countless hours between practices making sure the club was running smoothly. The amount of work he put into running the club we all loved was equivalent to taking a 4 credit class, and the results of his efforts were some of the best years in club history. As a player, Ian’s specialty was his big arm combined with his deadly cross-court shot. Traditionally stationed on the right side of the court, his right handed hook could fool even the most experienced blockers. He always preyed on inexperienced players not savvy enough to keep an eye out for their blocks, so any freshmen that came through MSU’s program learned the importance of this very quickly. While he wasn’t exactly known for his catching prowess, Ian was also a very reliable blocker and could protect several teammates as well as himself at one time. 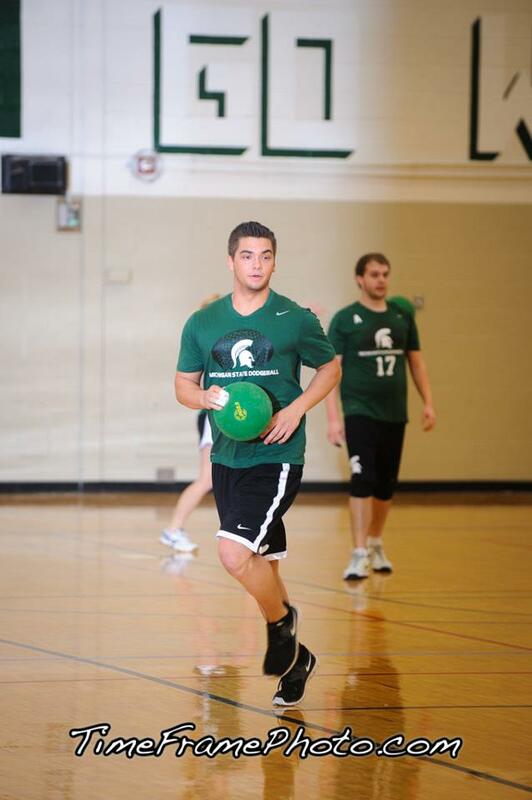 Unfortunately due to class and work, Ian’s last year at MSU was relatively Dodgeball-free. Despite his commitments to other places, Ian frequently texted me and talked to me about the club to keep tabs on its progress. The rookie class that we brought in during 2013-2014 always heard the older players talk about Ian, but most of them were unlucky in the sense that they never got to share the court with him. I consider Ian a great personal friend, and someone who was instrumental in my collegiate Dodgeball career. I don’t think I would have had such a positive experience without his contributions, and I’d always be more than willing to be his wingman on the court. His Hall Of Fame induction couldn’t come soon enough. Q&A Section Mike: What do you feel was your greatest accomplishment in MSU Dodgeball? Ian: I was really proud of creating the MSU Invite. It was a good tournament for our guys to get warmed up for the season and it helped retain or new players because they got excited about finally playing people from other schools. Mike: What is your favorite memory from your playing days? Ian: Oh I remember all the big plays. One year when we played NW State at Nationals on day two and we just looked awful. I think we were up 1-0 with under a minute to go until halftime and with under 10 seconds on the clock. We had them down to one player and I ran up, screamed for a ball and ripped it and got the 2nd point right before the buzzer. I also remember getting back to back headshots/catches against GVSU one time. Those along with whenever we won big points and the team rushed the court. It was awesome to see everyone so happy. Mike: What advice would you give to any incoming freshman? Ian: Work hard to be a part of the team. All the individual talent in the world is useless if you’re not a team player. Set goals for your season. Focus on them. Stick with them. The Spartans traveled to Grand Valley State University to take part in the Lakers first invite of the year. They played four games against in-state rivals CMU, GVSU, SVSU, and also Kent State. The first match of the day was already the second match-up in this young season against the Chippewas of Central Michigan. The Spartans came out strong and took the first point fairly convincingly after 13 minutes. Some good catches and solid throws led MSU to the early lead. The next point then ended with neither side eliminating the other before the half ended, although CMU had the advantage. Coming out of halftime the Spartans again played strong in a back and forth point. MSU was eventually able to eliminate all of CMU and take a 2-0 lead with only 6 minutes left. Both teams then kicked the slow play to the wall and came out firing for the last six minutes, with neither side eliminating the other again. The game ended with a 2-0 win for Michigan State. The second game of the day was against the lone out-of-state team at the tournament, Kent State. With several new players, Kent State was outmatched against Michigan State. The Spartans took four points before the half to se up a commanding lead. KSU came out of halftime fire up, however, and were able to take a point. MSU then finished the game by taking one more point to end the game at 5-1. The Spartans next match was against the team they have never beaten in their program’s history, Grand Valley State. Despite losing 6-0 the previous week, Michigan State showed no fear against the Lakers. Quick eliminations and catches gave the Spartans and early edge over GVSU. MSU then methodically eliminated each Laker to take a 1-0 lead going into halftime, with a couple minutes rolling over. But GVSU was not ready to lose their first game to Michigan State. They came out of halftime ready and took a point with roughly 18 minutes to go, to tie the game at 1. This set up the all-important third point of the match. After several minutes, both sides had eliminated a couple of their opponents. GVSU then made a couple catches and a couple hits to bring the Spartans down to five men and a ten-second shot clock. After surviving a couple more minutes, the Spartans failed to make a legitimate throw and suffered a shot clock violation. GVSU then team threw and eliminated Captain Colin O’Brien along with Ben Polcyn and Dan Grogis soon after with only 2:40 to go. With such little time, MSU tried all they could to try to take a point. The Spartans hit several Lakers and caught even more, but Grand Valley had five players left as the clock expired, giving them the win over MSU 2-1. Michigan State’s final game of the day was against Saginaw Valley State University. MSU again came out strong and took the first point, making several catches along the way. The second point then turned into a dull, slow game as both sides eventually got down to five players but both seemed content to go into the half with MSU in the lead 1-0. Coming out of the second half, Saginaw Valley turned the script and made some catches of their own, propelling them to tie the game at 1. Saginaw took and early edge in the fourth point, but was unable to eliminate Matt Jones and Rebecca Shappell. With the game tied at 1, both sides prepared for overtime. Michigan State sent Captain Colin O’Brien, Assistant Captain Alex Zajac, Tournament Assistant Captain Charlie Wilshire, Dan Grogis, Noe Galaviz, and Josh Brawley. One minute into the overtime period, SVSU eliminated O’Brien on a great team throw to take an early edge. The Spartans battled back with two eliminations to take a 5-4 edge. A caught MSU throw paired with two good throws by the Spartans left them with a one man lead of 4-3. Following a shot clock violation by SVSU, MSU eliminated a Cardinal player before throwing catch to level the sides at three players each. Saginaw then hit two MSU players as MSU hit a SVSU player in the span of five seconds to give SVSU a 2-1 edge. Following another shot clock violation, this time by sole remaining Spartan Charlie Wilshire, the two remaining Cardinals set their sights on a victory. On the ensuing team throw, Wilshire was able to dodge the first throw before failing to catch the second, sending Saginaw Valley home the winners of a thrilling overtime match. Michigan State went 2-2 on the day with a one-point loss to the defending champs on their home court and an overtime loss to the defending runners-up. With only nine players present at both of the Michigan State’s first tournaments, the rest of the season looks bright if the Spartans can find a way to put together a full roster. Michigan State traveled to Central Michigan on Saturday to compete in the CMU Invite. The Spartans had four games against CMU, GVSU, WKU, and UK in their first tournament of the year. The first game of the tournament turned out to be the best as Michigan State opened their season with a matchup against in-state rival Central Michigan. The Spartans started out slowly getting down early to the Chips in the first point. But James Schneider tried to bring State back. Making a couple catches and some nice throws, James eventually got CMU down to one player. In the 1-on-1 showdown, the CMU player made a nice jumping catch to take the first point for the Chips after 13 minutes of action. The Spartans then rebounded in point number two. After taking an early advantage, both teams had five people left with only a couple minutes to go in the half. After some quick eliminations, Charlie Wilshire made a great catch to even the score before half at 1-1. CMU looked to have control in the third point at the start of the second half. MSU was down to only three players against several from CMU. But Captain Colin O’Brien made sure a win would be the start of his tenure. He led MSU to bring CMU down to three players against State’s two before an untimely shot clock violation. On the ensuing team throw, O’Brien made a catch while avoiding the other two throws to give MSU the advantage. However, a catch and an elimination left O’Brien as the sole Spartan against three Chips. Colin then made a long throw to catch a CMU player sleeping and make it a two against one. O’Brien then proceeded to catch two consecutive CMU throws to win the point for MSU and gain a lead of 2-1 with 11 minutes to play. In the fourth point, Michigan State gained an early ball possession. With nine balls in hand, the Spartans made one throw at a time to kill the clock. O’Brien and Wilshire alternated throws for several minutes. After a CMU catch off an O’Brien throw, the Chips proceeded to bring up the tempo. With only a couple minutes remaining, MSU just tried to stay alive. CMU was able to bring the Spartans down to four men, but were unable to eliminate the team before time expired. Michigan State took the first game 2-1 in what should be a great rivalry all season long. The next three games were all one-sided for the Spartans. The net game for MSU was against the two-time defending champs Grand Valley State University. GVSU thoroughly outplayed MSU in every facet of the game, showing everyone why they have won the past two national titles and are still the team to beat in the NCDA. A rout of 6-0 showed that MSU still have room to improve before they can get their first ever victory against the Lakers. The next match for MSU was against the Hilltoppers of Western Kentucky University. Only bringing ten men, WKU faced a disadvantage all day. The Spartans made quick work of the Hilltoppers, taking a big lead into the half. WKU was able to take a point from the Spartans, however, late in the second half to end the game 6-1. Michigan State’s final match of the day was against the University of Kentucky. In a fun filled game, the Spartans took a 3-0 lead into the half. The second half showed why many people throughout the league love dodgeball, as both sides had a blast with the Spartans picking up one more point to end the game at 4-0. Michigan State finished the day with a record of 3-1. Despite missing several players and only bringing fifteen to the tournament, MSU showed why they are a team to watch out for in the NCDA. The good start for the Spartans gives them momentum heading into next weekend’s tournament at Grand Valley, where they will face Central Michigan again, Kent State, and Saginaw Valley State in what looks to be one of the premier tournaments of not only the first semester but the entire season. Michigan State comprised one-fifth of the entire All-NCDA team made up of the top fifteen players from 2014 NCDA Nationals at Ohio State University. All-NCDA mainstay Eric Paul was the first Spartan on the list. Eric, or EP, was a force for the Spartans all season, and throughout his whole career. Whether it be a big throw or a clutch catch, EP always was ready to make a big play. Captain Mike Van Ermen was the next All-NCDA player from MSU. His leadership was vital to the success of the Spartans as he played in his final tournament as a Spartan. A big arm for Michigan State, Mike also made some timely catches throughout the tourney. The last Spartan All-NCDA member was Assistant Captain and next year’s Captain, Colin O’Brien. In his sophomore season, Colin was ready to take on a leadership role for the Spartans. He helped Van Ermen lead the Spartans and made big plays for MSU on Sunday. All three Spartans earned their recognition with their play all Nationals long. MSU traveled to Ohio State to compete in the 2014 NCDA Nationals . After going 2-1 in group play on Saturday, MSU battled hard on Sunday. Earning a difficult comeback win over University of Wisconsin-Platteville, MSU then looked to take on Kent State in the quarterfinals. Despite losing to KSU the day prior, Michigan State was able to upset the higher ranked Golden Flashes to make it the their second consecutive Final Four. Their next opponent was in-state rival Saginaw Valley State. The Cardinals quickly took a 2-0 lead to open the first half. However, MSU battled back to cut the lead in half right before the end of the first half. The Spartans opened the scoring in the second half to tie the game at 2. Then, in a decisive fifth point, Saginaw was able to take the lead. MSU quickly gained a man advantage in the last point, but the clock was not on the Spartans side as time expired with SVSU down to just three players. It was a difficult loss for the Michigan State, but with 18 of the 20 members of the Nationals roster returning next season, the future looks bright. Michigan State traveled to Kent State for the first time in program history to partake in the Kent State Tournament a.k.a. the “Summer Street Slugfest”. Led by Mike Van Ermen, Colin O’Brien, and Andy Lieblich for the first time, the Spartans would play matches against Central Michigan, Kent State, Saginaw Valley, and Kentucky. This was being touted as a big beginning of the season showcase tournament, as all the teams involved were in the top eight of the preseason Captains’ Poll. Unfortunately, it did not go as well as the Spartans would hope. Nine of the sixteen players on the roster were playing their first ever varsity match, and they were down some of their bigger power throwers. However, other teams, such as Kentucky, were also down players, and everyone had first year players playing. In their first match, MSU was paired up with CMU, a team they had beaten twice last year (8-1 and 3-0.) This wasn’t the same CMU team though, as they came with a full roster and ready to play. The Chips would go on to win 4-1. Michigan State then faced Kent, who they defeated in the National Semifinals last year, and lost that one in a close one 2-1. After that was a 3-0 loss to SVSU, another team they K.O.’d from Nationals last year, and then followed by a 3-2 loss in OT to UK. The OT loss ensured the Spartans a point on the weekend, but they definitely would have wanted more than one. It also meant that MSU is now 0-4 in the new overtime rules (established before the 2012-2013 season.) State will look to rebound later on this Fall, as they will likely travel at least once more and host the MSU Invite. After reaching the National Championship Game last season, the Spartans have their sights set on winning the title this year. Despite losing six key members of last year’s team, including four All Stars, State should be even better this season. Part of this is the return of multiple key contributors who missed Nationals 2013, including three of the team’s hardest throwers, and another part of this is the general growth of the returning players. Add this to a potentially huge recruiting class by new captain Mike Van Ermen, and this is a team who should make a lot of noise in the NCDA this year. The Spartans first tournament this year will likely be in a little over two weeks at Kent State. This will be the earliest State has started their season in recent memory, and they’ll get some tough tests. Also participating in the tournament will be Kent State, Central Michigan, Saginaw Valley, and Kentucky. These are some of the best teams in the league, with all of them being top seven seeds at Nationals 2013, and there will be three of last year’s Final Four teams. Kent State and Saginaw Valley will want some payback after being knocked out of the Nationals tournament by MSU. Also on the schedule for this season for MSU are their typical home tournaments- the MSU Invite in the Fall and the Michigan Dodgeball Cup in the winter. They’ve also been given an invite to the GVSU Invite and the Chicago Dodgeball Open. And of course, Nationals 2014 in Columbus, OH.